PAGE MENU: GOAL The Project Particulars - Then and Now Project History Why Do this Project? 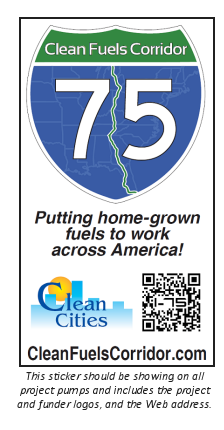 Establish I-75 as the nation's longest biofuels corridor, enabling travel along the entire 1,786 mile-length using either of the 2 primary biofuels, E85 or B20. * This only includes the first 3 months of 2014. In 2008, the East Tennessee Clean Fuels Coalition (ETCleanFuels) had grown to know many other U.S. DOE Clean Cities coalition leaders across the U.S. well, and was looking for opportunities for larger, multi-coalition projects to have a greater impact for America and for an American energy resurgence. The following year's DOE Clean Cities (non-ARRA) funding ended up being a great opportunity to bring one of the coalition's ideas closer to market: establish the longest biofuels corridor that the U.S. has ever had. For the proposal, a total of 21 different organizations came together to be part of the project (see our Partners page to learn about all the partners). Each brought and is still bringing different abilities or plusses to the project to ensure the success of the collaborative effort. Over $800,000 in the award; total project cost of about $1.8 million. Multi-state, multi-organization-type partnership with other Clean Cities coalitions, station owners, fuel marketers and similarly aligned companies that can help us place the pumps largely at existing stations and ensure assistance in marketing the fuel locally. Provide a maximum of $30,000 in a 50/50 cost match to the station owner or agent to assist them with their costs in making the fuel available to the motoring public. Ethanol as E85 is an excellent fuel for today's flex fuel vehicles, or FFVs. It is made to run only in those vehicles, so don't put E85 in a non-FFV! E85 will typically be 70-80% ethanol and 20-30% gasoline; the mixture shifts from winter to summer to maximize the use of ethanol in FFVs while maintaining vapor pressure requirements in cities or states with pollution problems. Ethanol is a cleaner-burning fuel and reduces many pollutants that are important in America, including the greenhouse gas carbon dioxide, or CO2. While ethanol does have less energy than gasoline on a per gallon basis, it has a higher octane rating which means more power! And with effectively priced E85, it can be the same dollars/mile for the user (it typically needs to be priced on the order or 20% less than gasoline). However, you can feel the American pride every time you fill up with a renewable, U.S.-produced fuel and know that you are putting your dollars back into the USA! Biodiesel is usually sold in blends like B5 or B20, which means respectively that 5 or 20% of the blend is biodiesel while the remaining is petro diesel. Blends up to B20 can run in any diesel vehicle that is 2007 and older, and in many vehicles that are 2008-2013. Ford and GM specifically note that their 2011 and later trucks are ready to run on B20! (Ford even put the word "B20" on their side of the F-series trucks!!) Biodiesel is produced through a process called transesterification which yields roughly 20% glycerine and 80% biodiesel. Pure vegetable oil is NOT biodiesel, and any fuel made from a process other than transesterification is NOT biodiesel. 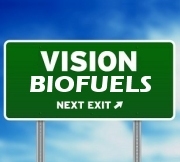 Other renewable diesel fuels do exist--like renewable diesel and green diesel--but don't confuse them with biodiesel.